It’s a relatively cheap, highly palatable food crop that can be easily grown in very limited space any time of the year in any weather without soil, sunlight, fertilizer, or pesticide. It’s harvestable in only three to seven days, and contains abundant quantities of natural vitamins, minerals, enzymes, and protein. No, it’s not a fantasy food—it just seems that way because sprouts are probably the only food on our planet that meet these seemingly impossible requirements. Sprouts are germinated seeds of legumes, cereals, vegetables, and herbs that are eaten either raw or cooked. These are living baby plants which make superb veggies and ideal ingredients that add flavor, texture, and color to salads, sandwiches, stir-fries, and soups. They have been part of the human diet for much of recorded history, as many civilizations have grown green sprouts for food for centuries. Sprouts are a convenient way to have fresh vegetables year-round, and can be grown in a mini-garden in the kitchen at home. One tablespoonful of seeds will yield from 150 to 250 grams of sprouts. Sprouts are excellent for vegetarians and those on a gluten-free diet, and are common in Eastern Asian cuisine. Commercial production has been a small niche industry in the U.S. for the past 35 years, although they are much more widely consumed in countries like Japan, where they’re part of the mainstream diet. The metabolic activity of dry, dormant seeds increases during soaking, which turns them into a nutritional powerhouse. Soaking mobilizes all of the stored food and enzymes needed by the entire plant, ushering the germinating seed into the highest growth phase of the immature plant. Soaking makes seeds chemical vitamin factories in high gear, turning out antioxidants and chlorophyll—which help cleanse and oxygenate the blood—and repackaging minerals and trace elements into a more bio-available form. Complex biochemical changes occur, as enzymes break down the reserve chemical constituents into simple compounds. Minerals chelate or merge with protein, increasing their function. Sprouts provide a good supply of Vitamins A, B complex, C, and E. Like enzymes, vitamins serve as bioactive catalysts to assist in the digestion and metabolism of food and the release of energy. They are also essential for the healing and repair of cells. Soaking seeds overnight in water cause them to yield greatly increased amounts of B and C vitamins. The vitamin content of sprouts can be 30 times higher than those of mature plants. The Chinese, as early as 5,000 years ago, valued sprouts for their healing and rejuvenating effects. Sprouts are rich in disease-preventing phytochemicals and antioxidant enzymes essential for the proper function of the immune system. Scientists have studied sprouts for centuries for their contributions to better health, from prevention to treatment of life-threatening diseases. Organizations like the National Institutes of Health, American Cancer Society, and Johns Hopkins University in the U.S. have bolstered the available research on the many benefits of sprouts, particularly their nutritional properties and validating health claims for the product. As food that requires little or no energy to digest, sprouts are perfect for people with acute or chronic health challenges. Fresh sprouts stimulate and help our self-healing ability, and supply the body with high-quality nourishment that we use for fuel. In addition to containing the many trace minerals, vitamins, and enzymes necessary for tissue repair, this pre-digested food frees the resources of the body from the work of digestion to speed up metabolism and overcome challenges to our immune system. • Pulses of the Fabaceae or pea family: mung beans, lentils, peas, chickpeas or garbanzo beans, and soybeans. • Cereals: wheat, corn, rice, barley, and rye. • Oil seeds: sesame, sunflower, almond, hazelnut, and peanut. • Vegetables: cabbage, broccoli, mustard, mizuna or Japanese mustard, tatsoi or spinach mustard, watercress, turnip and radish of the Brassicaceae or cabbage family; carrot, spinach, lettuce, celery, and onion. • Herbs: fennel, parsley, leek, arugula, and lemon grass. • Forage crops: alfalfa and clover, which also belong to the pea family. Sprouts of solanaceous crops such as tomato, potato, eggplant, and pepper cannot be eaten cooked or raw, as they can be poisonous. Cooking can remove the toxins from some, but not for others. As with all seeds, care should be taken that these are intended for sprouting or human consumption rather than sowing because seeds intended for sowing are treated with chemicals. The germination process, which lasts a few days, can be done at home manually with a semi-automated process or on a large scale for commercial use. Soaking the seeds in water is the first step. Depending on the type of seed, this can take anywhere from 20 minutes to 12 hours, Information on seeds to be sprouted is available from seed companies. Before soaking, the seeds must be rinsed to remove dirt and substances produced by some seeds when coming in contact with water. Soaking makes the seeds swell and begin germinating within a day or two. Draining and then rinsing at regular intervals until the seeds sprout is the next step. Different types of sprouting containers can be used. One is a simple glass jar with cloth secured over its rim. Any container used for sprouting must allow water to drain from it, because sprouts that sit in water will rot quickly. Any glass jar that holds about one liter is suitable. Seeds for soaking must be enough to cover the jar’s bottom about two seeds deep. Too much seed yields poor results. Put cool tap in about half the jar. Soak these overnight (6-10 hours). In the morning, with the strainer holding the seeds back, the first task is to pour out the water. In the afternoon, the jar is filled nearly full with cool water again, then poured out right away. Not draining the water will drown the seeds. Sprouts need to be rinsed from twice to four times a day, depending on the climate and the type of seed used. Rinsing provides moisture and prevents the seeds from souring. Each seed type has its own ideal sprouting time. Depending on the type used, after 3-5 days, the sprouts will have grown 5-8 centimeters long and be ready to eat. If left for a longer time, the sprouts will begin to develop leaves and become baby greens. 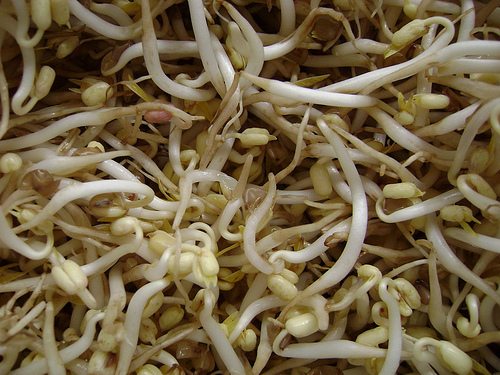 Mung bean sprouts or togue is the most popular sprouted product in the Philippines and the most saleable vegetable in Metro Manila markets. At the Cloverleaf Market in Balintawak, Quezon City, wholesalers dispose of tons of togue, their supply lasting only from dawn to early morning, while small retailers can each sell up to 100 kilos of the commodity. After mid-morning, it’s only in supermarkets where these much sought-after sprouts are available, albeit at higher prices, together with ready-to-serve sprouts like alfalfa, broccoli, radish, and peas produced by commercial suppliers like Melendres Farms in Antipolo City and Costales Nature Farms in Majayjay, Laguna. Alfalfa, one of the world’s oldest cultivated plants, is a flowering member of the pea family and thus a legume. An important forage crop in many countries, alfalfa contains many essential nutrients, is abundant in health benefits, and is the top antioxidant source among all vegetables. Alfalfa sprouts—which are white and thread-like with tiny green tops—are the only vegetable that supply a full range of vitamins, from A, B complex (even B 12), C, and E to K. Placed in indirect sunlight for a couple of days before harvesting, the sprouts produce nutritious, blood-healing chlorophyll. Regular consumption of these sprouts can prevent a number of degenerative diseases such as heart disease, menopausal disorders, osteoporosis, and even cancer. A compound in the sprouts inhibits inflammation, making it highly beneficial for people with arthritis. These sprouts also help lower blood pressure, boost the immune function by increasing the activity of natural killer cells, and contain an amino-acid, L-canavanine, that may be effective against leukemia. The active components in alfalfa lower LDL cholesterol accumulation in the liver, and are effective in the treatment of shortsightedness and intestinal ulcers. Individuals who have or are at risk for—systemic lupus erythematosus (SLE), however, should avoid or limit alfalfa consumption. Broccoli sprouts are 3-4 day-old broccoli plants that taste like radish. The flavor comes from a phytochemical that acts as an antioxidant to stimulate the ability of cells to protect the body against disease. A mild-flavored sprout ideal for salads and sandwiches, these are an excellent source of vitamin C, antioxidants, and other phytonutrients which help boost vitality and well-being. Broccoli sprouts became popular in the 1990s after a team of Johns Hopkins University scientists isolated a cancer-fighting phytochemical in broccoli called glucoraphanin. When chewed and eaten, broccoli releases glucoraphanin and myrosinase, an enzyme found in another part of the plant cell. These substances work together to produce sulforaphane, a compound that may have many of the protective properties for which broccoli sprouts have been so widely studied. Radish sprouts are eaten raw or cooked in some Asian dishes as well as in dishes in other parts of the world. Due to their delicacy, these sprouts are best slightly cooked by tossing into a stir-fried dish, where the residual heat will cook them. These sprouts have a hot, peppery flavor that go well with green leaves, salads, or sandwiches. Radish sprouts contain vitamins A, B, C, E, and K, along with zinc, calcium, and iron. These sprouts have 29 times more vitamin C and 4 times more vitamin A than milk. They also contain 10 times more calcium than a potato and more vitamin C than pineapple. Alfalfa, broccoli, and radish seeds for sprouting are available at Allied Botanical Corporation. The radish seeds are the same ones that radish growers buy, except that those for sprouting are untreated. Eating raw sprouts has one downside in that the process and conditions for germinating seeds are conducive to bacterial growth. resulting in dozens of outbreaks of infection with Salmonella and E. coli from commercially-grown sprouts over the past few decades in the U.S. and other countries. In June 2011, health experts in Germany identified contaminated bean sprouts as the source of an E. coli outbreak. In addition to that country, where 3,792 cases and 42 deaths were reported, there were a handful of cases in several other countries, with nearly all the affected people confirmed to have been in Germany shortly before becoming ill.
To avoid such incidents, both the U.S. Food and Drug Administration and Health Canada issued industry guidelines on the safe manufacture of edible sprouts and conducted public education on their safe consumption. To be on the safe side, people shouldn’t eat large quantities of raw legume sprouts – not more than 550 grams – regularly. Most sprouts, including alfalfa sprouts, can only be eaten raw and are thus not exposed to temperatures high enough to kill bacteria that may be present. Some sprouts, like those of the mung bean, are best eaten thoroughly cooked. Certain groups of people who are generally at higher risk for severe foodborne illness are pregnant women, young children, the elderly, and anyone whose immune system is weakened. People in these groups should avoid eating raw sprouts, especially those of alfalfa and mung bean. They should also avoid eating cooked bean sprouts in stir-fries or soups, unless they know that the sprouts have been well-cooked. Here in the Philippines, mung bean sprouts or togue are safe because we never eat them raw. In fact, lumpiang togue—a favorite in restaurants and small eateries (carinderias)—is cooked twice; first, cooks stir-fry the togue-veggie mix before apportioning it in lumpia wrappers and frying the whole thing. To prevent bacterial growth in the sprouts that they produce and ensure that these are safe to eat, Melendres Farms and Costales Nature Farms treat the water that they use in soaking and rinsing seeds for sprouting with effective microorganism (EM) concentrate. They use one milliliter of the concentrate for every’ liter of water, which must be unchlorinated because chlorine kills beneficial microorganisms. EM’s lactic acid content and low (3.5) pH inhibits Salmonella and E. Coli growth, in addition to hastening seed germination.